As Gutenberg will change everything about WordPress, you need to take control of your updates until all the glitches are worked out. See how to use the Easy Updates Manager plugin to control when you do both minor and major updates. What’s the Difference in a Minor and Major Update? A major update is going from 4.6 to 4.7, or from 4.9 to 5.0. A minor update is going from 4.9.5 to 4.9.6. Why Do I Need to Control Updates Now? Minor updates used to only contain bug fixes and security releases. And we used to be able to allow minor changes to automatically update, mainly so those security fixes would hit our sites immediately. But, the WordPress devs reserved version 5.0 for the release of Gutenberg into the WordPress core. Because of that, they have to include major updates into what should be minor releases. And, because Gutenberg is such a major change, it’s likely that we will want to be even more vigilant than usual about any core update for at least a year. 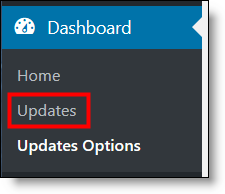 NOTE: When you turn updates off by either method shown here, you will no longer see update notices in your site. You will need to be extra vigilant to manually check for updates. NOTE: If you are on SiteGround Hosting, they have made themselves the middle-man in your update process. You will need to open a support ticket and ask them to remove that feature so you can fully control your WP updates. Note for Yourself – Do not continue to use their update feature via cPanel or any other method. In other words, don’t set that thing to delay 72 hours or such. You want to remove them from being in the middle completely. You can either hard code the control of updates in your wp-config.php file, or use a plugin. If you are a site tech, and know how to take proper precautions to backup your WordPress core files, then you may want to use the hard-coded method. If you are not a site tech, please use the plugin method. NOTE: I do not offer on-demand support for either method if you goof it up, or have other issues on your site. If you’re not comfortable doing this yourself, by all means hire a qualified tech to do it right the first time. It will be WAY cheaper. UPDATE 12/13/18 The following code will not turn off minor WP updates, and it will not stop minor updates for plugins and such either. Please use the Easy Updates Manager Plugin if you want to stop all updates. Add the following to your wp-config.php file, at the bottom. This will turn off ALL WordPress updates, both major and minor. There are other directives you can input to get finer control. If you want those, just Google it. For non-techs, this plug is the best way to go and will keep the whole process super simple and clean for you. Install the plugin from the WordPress plugin repository (same place you get all other free plugins). under Dashboard > Update Options. The plugin offers a TON of features for specific control of every update-able item on your site. But for this tutorial, we’re going to keep it super simple, and focused on the temporary situation we have with WordPress core updates. 2 different setting options are shown here. Choose only 1 of them!! This is a more drastic setting, but it ensures that nothing on your site will update, including WordPress, plugins, and themes. This is normally not a recommended setting and should only be used when the WP 5.0 release is imminent. You’ll want to go to Setting Option 2 once the initial release storm has passed. In the first module, click on Disable All Updates and it will turn green. There is no Save button or such for the settings. This is the preferred setting for just disabling WP core updates. Your plugins and themes will continue to send update notices and do minor updates. Scroll down to the WordPress Core Updates section. Click on Disable Core Updates, and it will turn green, signifying that it is on. NOTE: Don’t turn any other setting on. Reminder: You may not see all update notices on your site while this plugin is active. So, you may need to check WP and plugins manually to see if updates are available. Be sure you get a full backup before attempting any updates to your site. Once a WordPress update does roll out, and it is safe to do it, follow the instructions below. Go to your Dashboard > Update Options. depending on which option you used. Then, go to Dashboard > Updates. You’ll see all of your available updates, as usual. If you don’t see a WordPress update available, then click the Check Again button, so it will refresh. Then update WordPress and check your site. 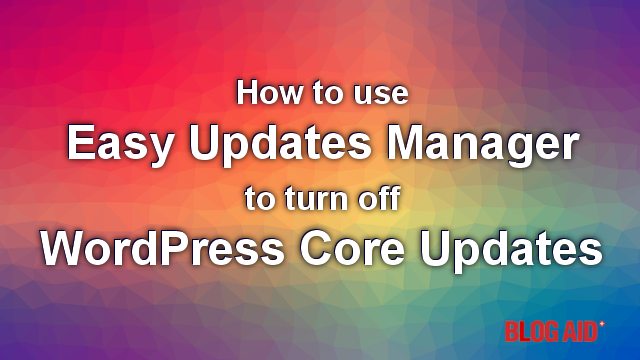 If all is well with your site, return to the Update Options, and either Disable All Updates or Disable WordPress Core Updates again, depending on your needs. 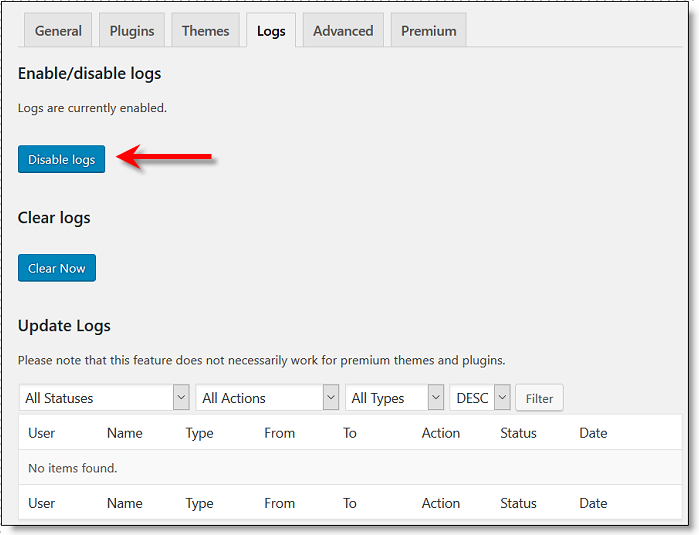 EUM version 8.0.3 now has Logs turned on by default. Mine did not suddenly go to Enabled when I updated the plugin, but yours might. To check your log settings, go the Logs tab, as shown below. You can clear the logs, then disable them, if you like. But, you may want to leave them on during this WP transition period. Just be sure to clear them regularly, like weekly. Get Your Site Success Tips! I empower DIY site owners and teach webmasters/designers. Follow me everywhere. I’ll keep you way ahead of the curve and out of panic with your site. This is just bad advice. The minor updates should not be disabled. The only updates that go into the minor updates are important and need to be applied as soon as possible. The only “major” update was the one addressing the new privacy feature that was built for GDPR. Between now and 5.0 there may be several security releases and this advice will make people think they shouldn’t update their sites with those security releases. One just came out yesterday and this advice will cause people to not install the update which can make them vulnerable to the security vulnerabilities that were patched in that update. Please stop using fear of Gutenberg to generate bad advice. Normally I would agree with you Nick. But we have too much stuff going into some of the minor releases, and too much glitchy happening right now. LOTS of folks in the dev community screamed about how much major stuff went into that GDPR release that was not related to the privacy stuff. As stated in the article, I warned folks that they will have to be vigilant about watching for update news. And I send word out out to the folks who follow me. Maybe all you caretake is your site, and you are tech enough to deal with everything that might happen to it. I get an email every 7 minutes, 365 days a year with folks needing help over updates and such, plus in all the groups I run. So maybe our perspectives are different based on our experience, and how many people we serve, and who they are. Thanks for the wonderful article. I know that many people can read this acurately and will get the picture. You are easy to follow and explain things in detail. Thank you. You’re welcome, Marilyn. Sorry I couldn’t get to it sooner. But glad we have it now!! Just to be clear, if I have requested SiteGround to turn off their auto-update, will I still need Easy Updates Manager to ensure I don’t get any auto-updates I’m not ready for? Thanks! Yes, you want SG to get out of the middle and put yourself in. I really hate that we have to take drastic measures with the EUM plugin settings, but it is the only sure fire way to be safe from buggy updates right now. But it is a temporary measure, due to other security concerns. I’ve just spoken to SiteGround and they have suspended ALL automatic updates for at least the next seven days. So I guess they are tip-toeing through the 5.0 minefield too. Yeah, it is a liability for them to be in the middle anyway. They are not a managed WP host.